By and large I agree with the headline. The Lunarepic is one of the most innovative shoes I have seen in a long time and a very well executed collection of new concepts. As a runner who experienced Nike's earliest innovations back in the 70's as a high school aged wear tester when their original R&D was in my home town, I am excited Nike is back on a serious innovation train. 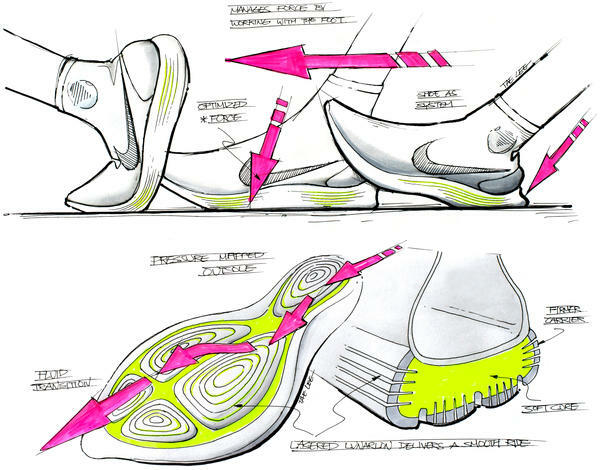 The Lunarepic is a Concept Shoe that is practical, different, and most importantly a fabulous ride. 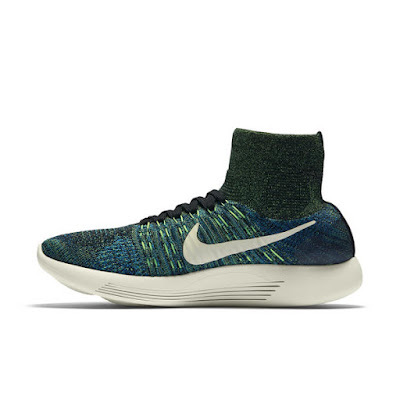 They are described by Running Warehouse, where I got mine, as weighing 7.8 oz/ 221 g size 9 men's, 6.6 oz/ g women's with a 28mm heel 18 mm forefoot, 10mm drop. At $175 the price is in the stratosphere. I bought my Lunarepic at retail. Here is how those headlines play out. Part of the tooling, the no rubber outsole, which is really the ground and sidewall layer of the midsole, has deeply siped (scored) pods deform for a subtle, smooth ground conforming piston like effect on landing and takeoff, the fluid feel. It's not exactly a soft shoe but it does have the unique and very pleasant "superior softness", one with no sense of either bottoming out the cushioning or sinking to far without rebound. From heel to toe, upper to midsole/outsole the on the run feeling is one of seamless unity between foot and shoe. 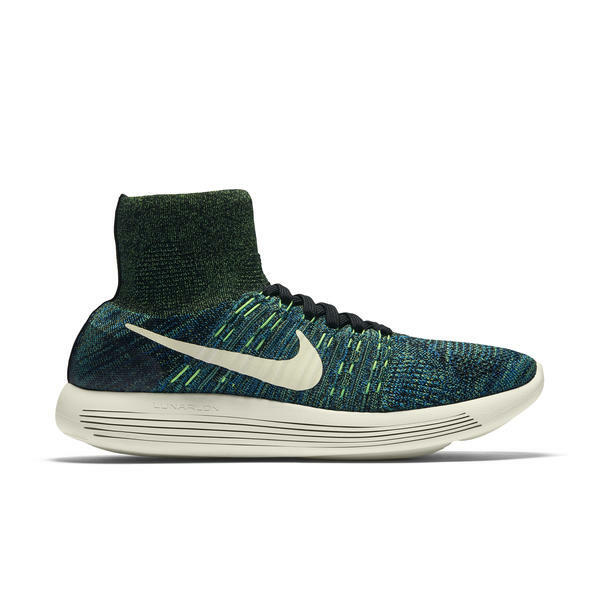 While Nike's Flyknit is not new, in the Lunarepic it is taken to new "heights" with a middle ankle collar integral to the rest of the knit upper. Reminds me of the very effective collar in the earlier 2014 adidas XT Boost road/trail hybrid shoe (review here), Nike claims the "mid-height collar was added to facilitate lockdown, both physically and sensorially... ". Absolutely the case for me. There is no gap in the perceived or actual relationship between foot and shoe at the heel. The functional variations in knit densities is incredibly detailed. What would I do differently with the upper? The heel "counter is a bonded overlay. I think it could be slightly more substantial and maybe higher for those who land unevenly on the heel. I felt a bit of instability at the far back of the heel. The collar itself is lined with green stretch fabric. The only sewn piece in the shoe, a lumpy feeling black strip at the heel and another inside joining the two sides was somewhat irritating in other than higher socks, right where the heel counter ends and at the top. Not sure why this fabric join piece is not more flexible, understanding that some substance and stitching is in order there to hold the shoe together when sliding it on. The mid foot is superbly well held by the Flywire cords. They are easy to lace to the right pressure, always an issue for me. In fact only a light lacing was required in my true to size pair. I tried the included thicker insole and found the fit to snug. Sizing down a half size and I worry I would run out of toe room in the somewhat pointy toe box. Nothing about the toe box was an issue. These two words are interchangeable in the case of the Lunarepic. "Moving to the midsole, the designers employed a new dual-injection technology. Using heat, instead of glue, they fused two foams into one piece that still features traditional Lunarlon construction, with an IU foam carrier and soft IP core." a rubber-free outsole with laser-siped geometric pistons inspired by pressure maps of the foot was added. Constructed of Lunarlon foam, each piston moves individually, enabling pointed compression that results in an exceptional ride. Maximizing both cushioning and traction, it provides unrivaled heel-to-toe transitions and propelling energy return. Another big mouthful! Well again another effective innovation. There is a definite subtle sense of foot meeting road on top of mounded pistons, a gradual smooth compression and then release. It's not a noticeable piston as in a Newton or a single surface deflecting down as in the Altra Impulse. It is more noticeable in the forefoot where pressures are lighter than the heel. In the heel essentially its a single large piston. The pods are essentially a full outsole coverage particularly in the forefoot and feel like they adapt to my foot pressures at various stages of my gait. The sipes also provide great traction on wet pavement, boat shoe often have such cuts in the outsole. I tried running the always slick white paint lines in a rain storm and the grip was fine. The sipes or cuts into the pods definitely play a big role in this unique feel. They contribute to the smoothness of the ride and considerable flexibility of the shoe. As they are mostly longitudinal they keep the shoe relatively stiff laterally for an element of stability. They also provide great traction. As others, such as Thomas at Believe in the Run, said in his fine review the sipe cuts do accumulate small road grit but no bigger pieces have jammed in so far with potential for tearing. Not sure I would take them trail running but at some point will have to try. Might be quite good if the outsole does not get ripped to shreds on rocks. Not noticeable when running, removing the grit makes for some dental tool "flossing" after runs! Well a good part of the midsole is actually the outsole as well. The white Lunarlon is a carrier for the green softer inner core. The idea is that the outer shell stabilizes and the inner core cushions. Again I found this approach highly effective on the run. On the lateral side the midsole is wiped to provide a longer compression to aid toe off. Now for the important part... How do they run? The ride is unique. Nike described it well when they called it "superior softness". This by no means a marshmallow soft ride where cushioning bottoms out, or the foot sinks and sinks and one wonders what's next, how do I get up and along. It is also by no means firm in a traditional harsh sense either. I might describe it as "active" softness: plenty of cushion, a dosed and subtle piston like feeling on the way down and then up especially at slower speed. At faster speeds a smooth and relatively firm ride but with no harshness. The forefoot flexibility is noticeable, but given the upper, and I think the pods as well, there is no sense of having to work the foot to push off, no turning of the forefoot in the roomy and comfortable upper. Everything works together in the Lunarepic, very smoothly and with great confidence. 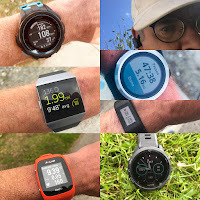 I might wish for a bit more forefoot spring and stiffness along with a slightly more substantial higher heel counter with a smoother rear seam but that's about it. The Lunar Epic runs lower than its 10mm drop for me. Nike Lunar Tempo is also a shoe with Lunarlon shell and inner softer core. 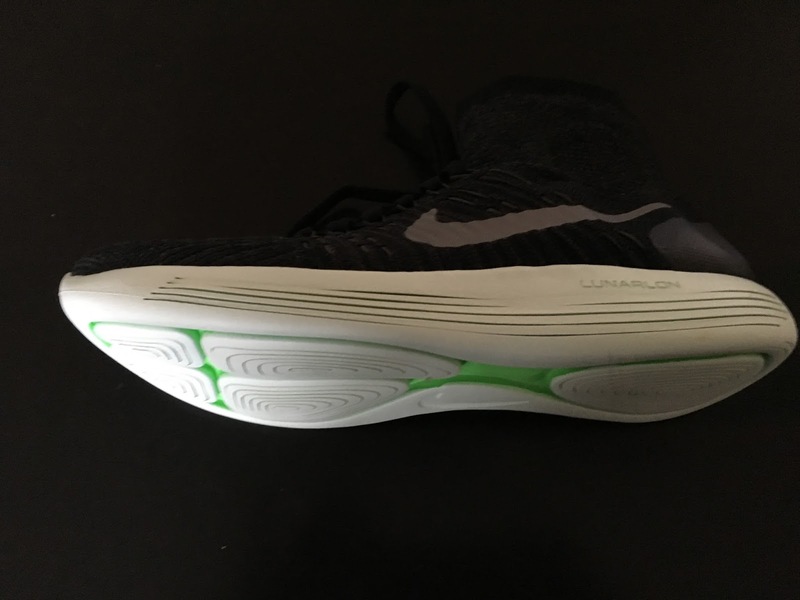 The Lunarepic is more stable, more directed, less slipper like. While the Lunar Tempo is just about as flexible there is less of a sense of the foot having to claw to toe off. 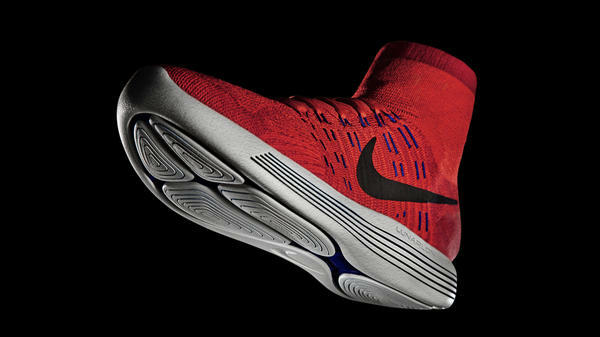 Both have about equal cushioning but the Lunarepic has noticeably more yet subtle piston like pop off the road. The 2 stars of 2016 for me. The Clayton due to its dual density midsole, softer heel with firmer forefoot has a different ride, a segmented feel while the Lunarepic is truly all of a piece. I would give the Clayton a slight nod for longer runs and the Lunarepic for relatively shorter and faster runs. Saucony Kinvara 7 vs. Nike Lunarepic. Clearly the Lunarepic has a superior upper for anything but a short fast race where I might give the Kinvara's more traditional snug near race flat fit the nod. 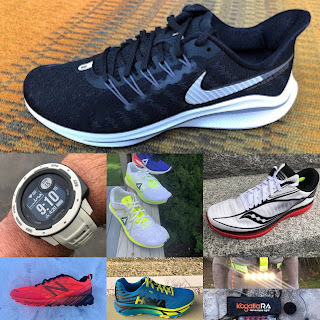 Underfoot the heel of the Kinvara remains top of the class for me for 2016, the Everun really makes the difference, definitely a better rebound in the back for the K shoe, with a more agile better cushioned forefoot for the Lunarepic. If it fits your foot the Kinvara 7 is a faster shoe. 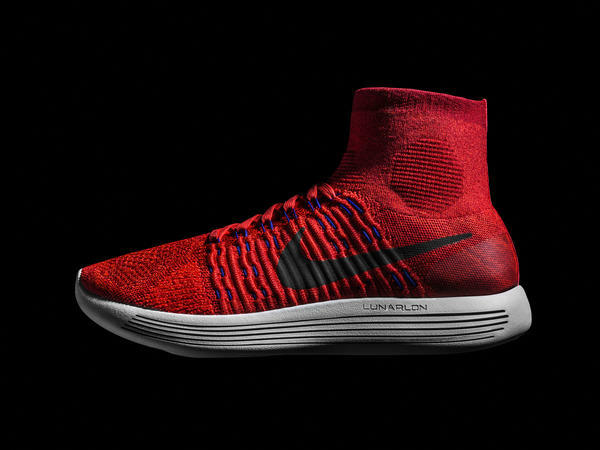 Nike recommends the Lunarepic for distance, recovery, progression. For many mid pack runners, and my advanced age I am one too, it can be a fine single shoe in the quiver for all purposes and races. The Lunarepic is packed with innovation and careful design, all of which works brilliantly and just about perfectly together on the "first try". The mid height collar and the siped podded outsole are the technical highlights but also the features that shine. From heel to toe, upper to midsole/outsole the on the run feeling is one of seamless unity between foot and shoe. Highly Recommended! -0.1 for some needed refinement to the heel area: counter and seams. -0.1 for price at $175 and open questions about long term outsole durability. 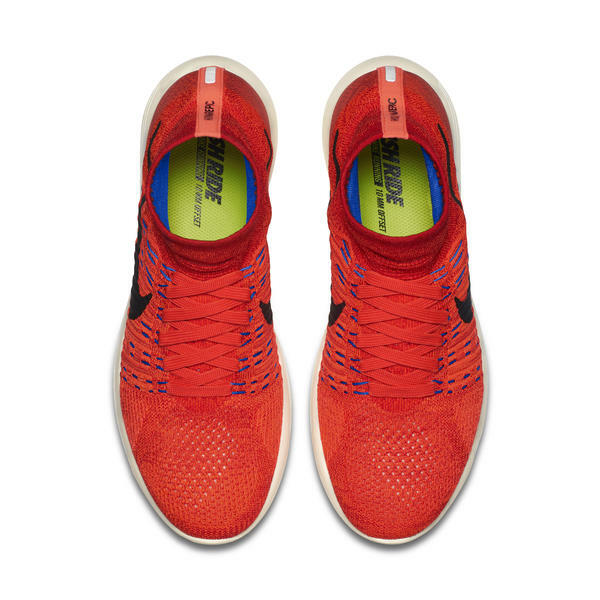 The Nike Lunarepic Flyknit is available from Running Warehouse. Use Road Trail Run Coupon Code: RTR10 for 10% off. I have only ten miles on my Lunarepic's but I feel it might be the 'beginning of a beautiful friendship.' It's the most excited I've been about a running shoe, albeit after only two runs, since my Hoka Huakas. Like the author I'm an aging forefoot striker though you would more often find me near the front of the bottom third lol.